A YORKSHIRE Euro-MP has demanded the region by given a voice in Brexit talks alongside London and the devolved nations. Labour MEP Linda McAvan claimed Yorkshire’s economic plans were now in question given the significant role of EU funding to the region. Earlier this week, the Prime Minister promised Scotland, Wales, Northern Ireland and Gibraltar would be consulted as part of the process of ending Britain’s EU membership. In Brussels today, David Cameron continued to insist Brexit negotiations would not start until his successor has been chosen. Yorkshire is due to receive £600m in the current EU funding round to help grow the region’s economy. Ms McAvan said: “Our local enterprise partnerships are basing their plans on EU funding coming in and I think they will be affected. We also know our universities are going to be majorly impacted. “We need to be asking the prime minister why Yorkshire doesn’t have a voice. “I think we need a regional voice and there should be consultations with our newly devolving administrations. At Prime Minister’s Questions in the Commons today, Mr Cameron told Sheffield Central MP Paul Blomfield that he could not guarantee the city would still receive £180m of planned EU funding over the next four years. Mr Cameron said that only in time would it be clear how such planned funding is affected. After the exchange, Mr Blomfield said Leave campaigners should be held to account over promises they had made about funding. He said: “The Leave campaign made promises about matching the future funding that was due from the EU. I will hold them to account. During the course of the referendum campaign, Boris Johnson, Michael Gove and other senior Conservatives signed a pledge promising that any organisation or region receiving EU money would continue to do so until 2020 in the event of a vote to leave. However, it will not be clear whether or how that pledge will be honoured until the new prime minister is in place and detailed plans for how Britain will deal with leaving the EU are drawn up. Mr Cameron was in Brussels today for a scheduled European Council meeting with other EU leaders where he repeated his insistence that Britain retained the right to choose when to trigger Article 50 of the Lisbon Treaty and begin Brexit talks. He said: “While we are leaving the European Union, we mustn’t be turning our backs on Europe. After days of pressure from EU leaders to begin talks immediately on the UK’s departure, EU Council president Donald Tusk acknowledged Britain was in the driving seat. However, he also underlined the EU’s insistence there would be no discussions before the official process gets underway. He said: “Everyone should be aware of this fact, which means that we also have to be patient if there is such a need. “Europe is ready to start the divorce process, even today, without any enthusiasm, as you can imagine. “This is not the scenario we were dreaming about. We have precise procedures, we have a ready work plan. 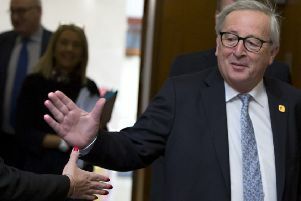 EU Commission president Jean-Claude Juncker underlined the point, warning Brussels chiefs have been ordered not to enter into any “secret negotiations” with the UK over the terms of Brexit. In a sign of the immediate change of Britain’s status in Europea, Mr Cameron has not been invited to the second day of talks, when the other 27 leaders will hold informal discussions. But German chancellor Angela Merkel struck a conciliatory note today, saying she hoped the remaining 27 EU states would continue to regard Britain as a “friend and partner...despite this separation which we all regret”. Luxembourg’s prime minister Xavier Bettel said the result of the withdrawal process must be clear-cut.